Fellowes Powershred C-220i is the most reliable strip cut shredder. It is 100% jam proof paper shredder with automatic start/stop function. With compact size and dimensions, this shredder is ideal for small offices (1-5 users). It can easily process 20 sheets per pass. With its hard cutter, it can shred the material into very small 7/32″ strip-cut particles. 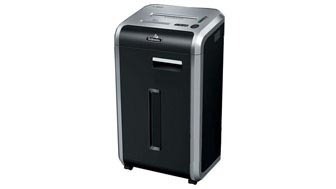 This Silent Shred (A Fellowes brand feature) shredder operates very quietly and is perfect for shared workspaces. It is equipped with an enhanced safety mechanism. The patented SafeSense technology stops the shredder immediately if the users hands get in close contact with the feed opening. Available in two different colors (Black/Silver), the Fellowes Powershred C-220i strip cut shredder can shred staples, paper clips, credit cards and CDs. The shredder comes with the lifetime warranty on cutter and 3 Years warranty on machine. Fellowes Powershred C-220i is designed for an office with about 5 users. It is beautifully designed to fit into any office decor.